This is probably one of the topmost concerns in most surgical patients' minds and something anesthesiologists get asked almost daily. What are the chances I'll die during surgery? For healthy patients, we almost always pooh pooh away the inquiry and say in our most reassuring voices that it is very rare, especially for young healthy patients. But exactly how rare is it? Now here is a study that tries to answer that question. In the latest Anesthesiology News, researchers from UC San Diego looked at a database of over 1.5 million patients classified as ASA I or II who underwent surgery. Eleven percent had emergency surgery and 80% had general anesthesia. They found that overall 0.11%, or about one in one thousand, died within 30 days of surgery. As expected, different operations carried different levels of risk. Thoracic surgery had a 30 day mortality rate of 0.55% while general surgery had 0.3% and plastic surgery had 0.03% risk. The researchers also looked at different patient factors that affected mortality risks. 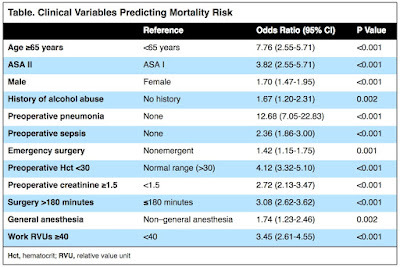 As expected, things like age, length of surgery, difficulty of surgery (expressed as number of relative value units) can determine the riskiness of the operation. Surprisingly, a small innocuous bump up from ASA I to ASA II was enough to cause an increased risk. In a time when the average age of our surgical patients seem to approach 80, age greater than a relatively youthful 65 increases mortality rates. Men are SOL when compared to women in likelihood of dying. Curiously, some of these elements wouldn't seem to qualify a patient for an ASA II status, such as preoperative sepsis and pneumonia. 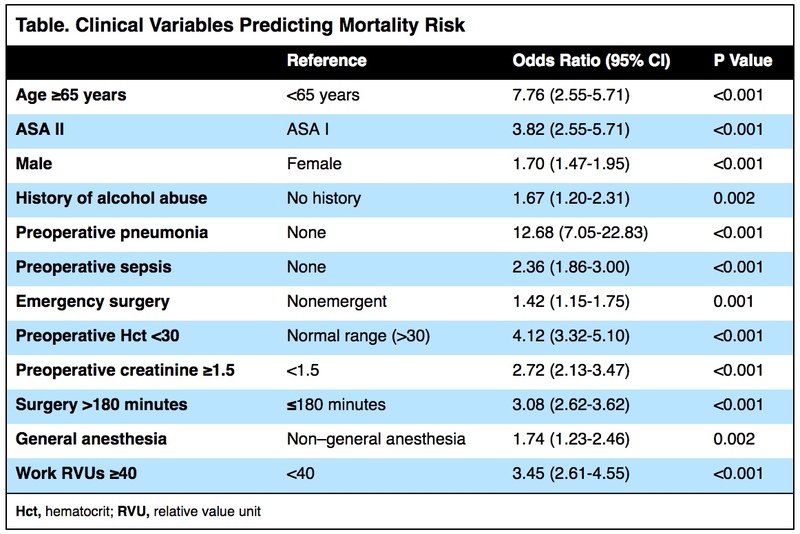 So next time your patient asks you if they will die during surgery, you now can answer confidently the risks are extremely low and you have the numbers to back it up.